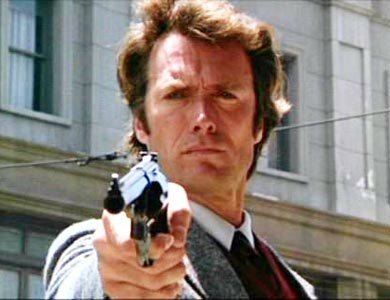 Inspector Harry Callahan (Clint Eastwood) does not much care for due process or legal niceties; he generally just wants to blow the bad guys away with his .44 Magnum gun. He asks questions only if they survive the shootout and are lying in a puddle of blood. 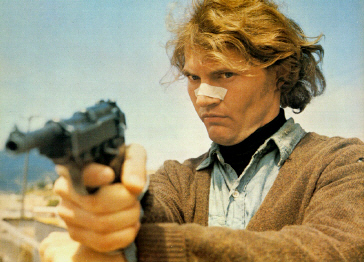 Dirty Harry keeps the Man With No Name in the wild west, in this case San Francisco, but fast forwards to the modern era. Cars replace horses, highrises replace saloons, but the general rules remain generally the same: the difference between the bad guys and the good guys is a matter of perception. The main bad guy here is an unhinged murderer calling himself Scorpio (Andy Robinson), killing innocent victims with a sniper rifle and taunting the Mayor of San Francisco (John Vernon) that the killing will continue unless a ransom is paid. Callahan is assigned to the case, but the politicians and his police superiors do not approve of his straightforward methods, and Callahan grows increasingly frustrated by what he perceived to be the weak-kneed reaction of the Mayor. When Scorpio is finally apprehended, he is let loose because Callahan failed to secure a search warrant. The killings therefore resume, and a disgusted Callahan has to disobey orders to bring the matter to an end. In bringing Eastwood's western movie persona to an urban setting, Dirty Harry re-wrote the rules for police action films. The anti-establishment, unconventional loner cop, frustrated by rules and process and prone to extreme violence, became the new standard for movie cops. Director Don Siegel and Eastwood provide Harry with an overwhelming cool factor. Standing straight and without cover as he trades blasts of gunfire with the bad guys, Harry needs to look down at his leg to realize that he has been hit by a shotgun. His walk, his talk, his hair and his cheap shades create an instant movie hero. Robinson is a genuinely disturbing Scorpio. Although the movie may have benefited from providing a more in-depth back-story for the villain, when Scorpio starts to abuse school kids on the hijacked bus while demanding with increasing agitation that they sing "ROW ROW ROW YOUR BOAT! ", he enters the annals of great screen bad-guys. Dirty Harry spawned four direct sequels and countless imitators. Its achievements also include creating in Harry Callahan one of the movies' most memorable screen characters; igniting Clint Eastwood's career as a Hollywood superstar; and giving the film world a most memorable line of dialogue, delivered through gritted teeth.